'Jhanpi' is a remarkable novel by Shirshendu Mukhopadhyay who is a famous modern Bengali pen man in Bengali literature. The author wrote a lot of famous books in Bengali language. There are some popular books list of his writing- 'Adim, Ivo O Andhokar', 'Bholobasa', 'Phul Chor', 'Nor Narir kotha', 'Pidimer alo', 'Durbin', 'Chokh', 'Jao Pakhi', 'Parthib', 'Kapurush', 'Sei Ami', 'Bangalir Amerika Darshan', 'Gati', 'Din Jay', 'Ghun Poka', 'Rangin Sako', 'Guha Manab', 'Jugal Bandi', 'Fazal Ali Aschhe', 'Ekadashir Bhut', 'Lal Nil Manush', 'Dwitiyo Sattar Sandhane', 'Shunyer Uddan' etc. He also wrote many famous fiction for children as 'Manojder Adbhut Bari', 'Patalghar', 'Nrisingha Rahasya', 'Chhayamoy' and 'Goshai Baganer Bhut'. Now I want to share an another popular novel of this author- 'Jhanpi by Shirshendu Mukhopadhyay', the ebook pdf has 160 quality pages, 8mb file size. Collect the novel as pdf file from link below. 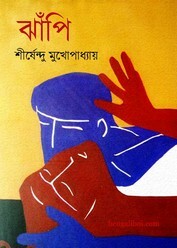 Bengali novel pdf - Jhanpi by Shirshendu Mukhopadhyay.